Lemon curd is a delicious addition to tarts (see here for crust recipe and meringue recipe here, cookies, bars (see lemon raspberry bars recipe here), cakes, pancakes, crepes … or just simply, and liberally, spread on toast with a cup of tea (if your lucky, lying in bed with your significant other eating the lemon curd on toast, or what have you, without any kids screaming and jumping on the bed). I’m making raspberry muffins tomorrow for Valentine’s Day – a sweet, little surprise with breakfast on Saturday (one more test on that recipe to satisfy my standards). Not that I celebrate this over commercialized day with much fuss, just a little token of love. 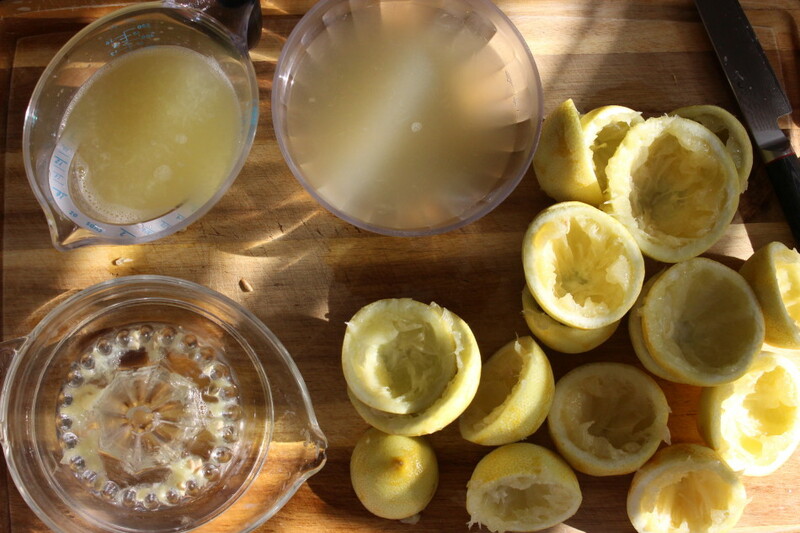 Okay, and another excuse to shmear more lemon curd. This stuff is like a little black dress. It goes with everything. Everything! 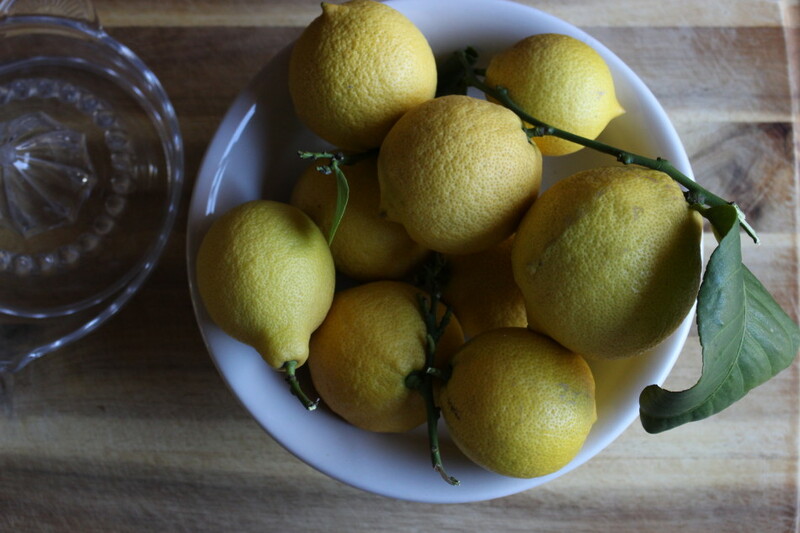 Lemon curd is not something that’s easily found in stores, at least without gluten and dairy, or a hefty price tag and a necessary “condiment”, so when life hands you lemons – many lemons (my lemon trees have been good to me) – make lemon curd! If you (or your significant other) loves rich, creamy, citrus spread then go get a bunch of lemons and start squeezing because this is quite a treat! 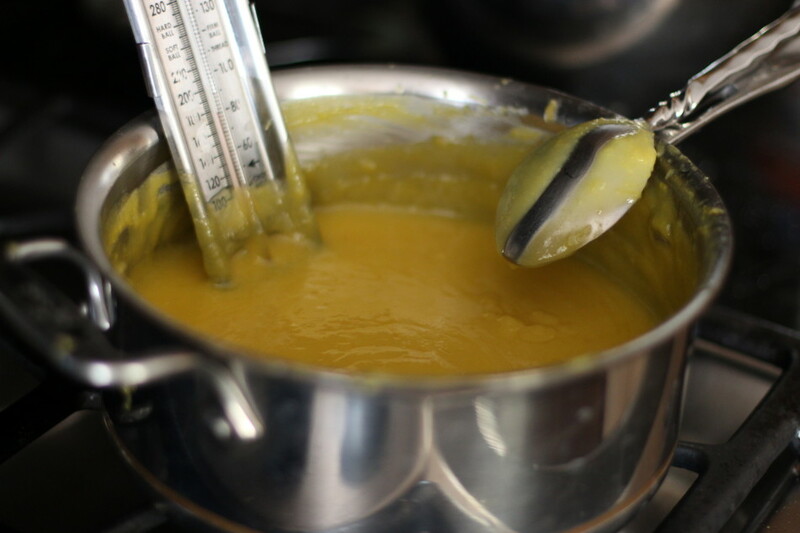 An easy lemon curd that doesn’t require the french technique of using a double-boiler AND all the citrus pucker a lemon enthusiast is looking for … enjoy! 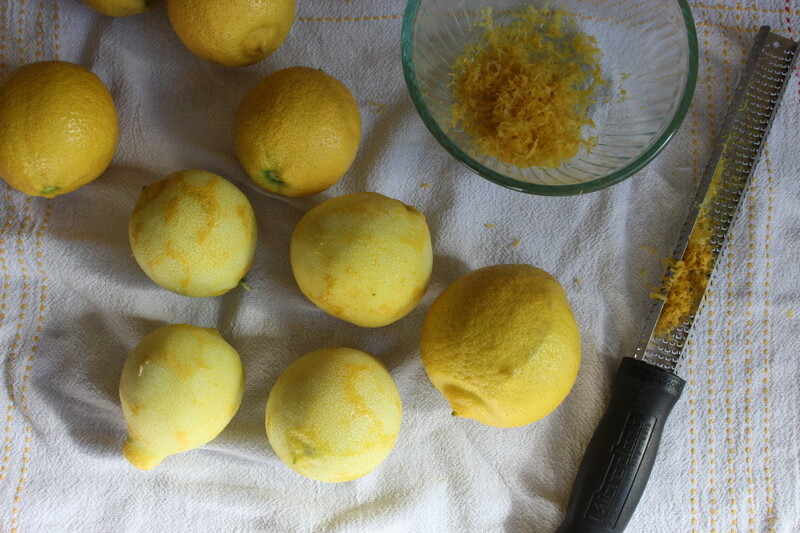 Zest lemons (skin only, not the white pith) before squeezing for juice, otherwise it will get messy and difficult. A microplane is the best tool for this. 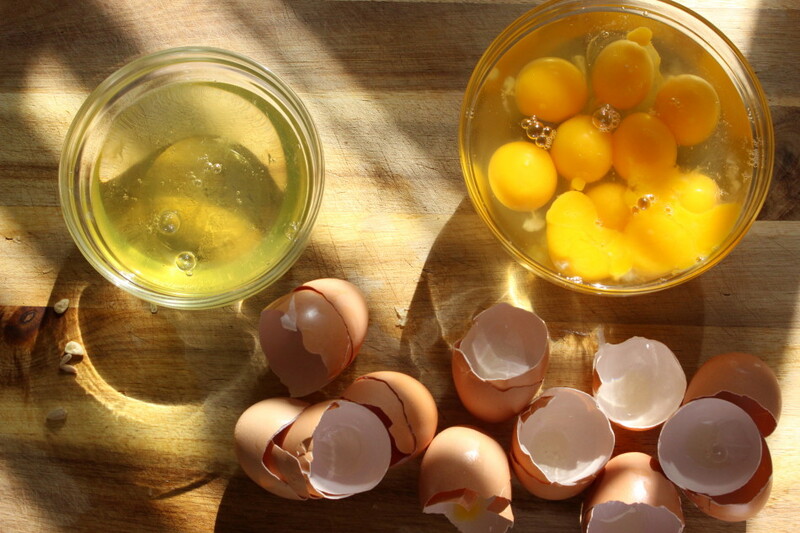 Separate the three yolks from whites by transferring the yolk from one half shell to the other over a small bowl while the whites drop into the bowl until all the whites have separated from the yolk, then transfer yolk to another small bowl. I save the egg whites I don’t use for an egg white omelet or to make a meringue frosting if I’m using curd for a tart. I have more juice than needed for this recipe to go into my kale lemonade, to which I added kale, water and liquid stevia then mixed up in a blender. Lots of immune boosting lysine and protein! 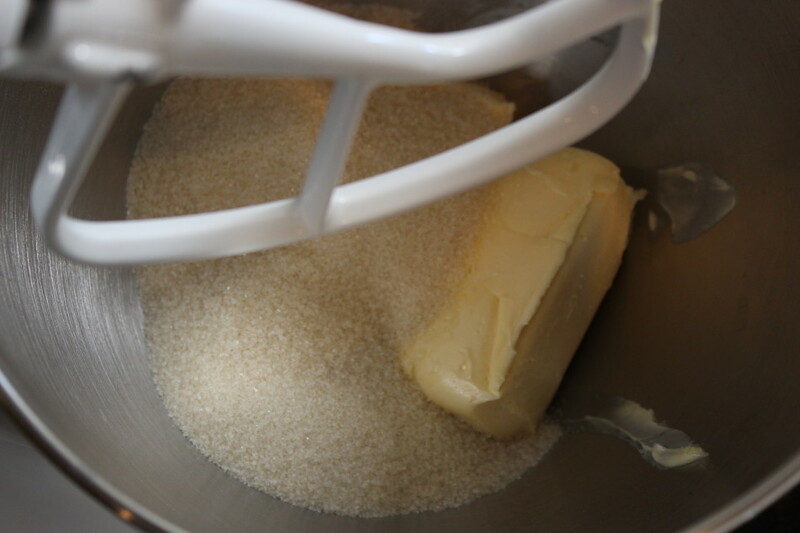 In a stand mixer set with a paddle attachment, cream the Earth Balance and sugar on medium speed for about 2 minutes until it appears creamy. 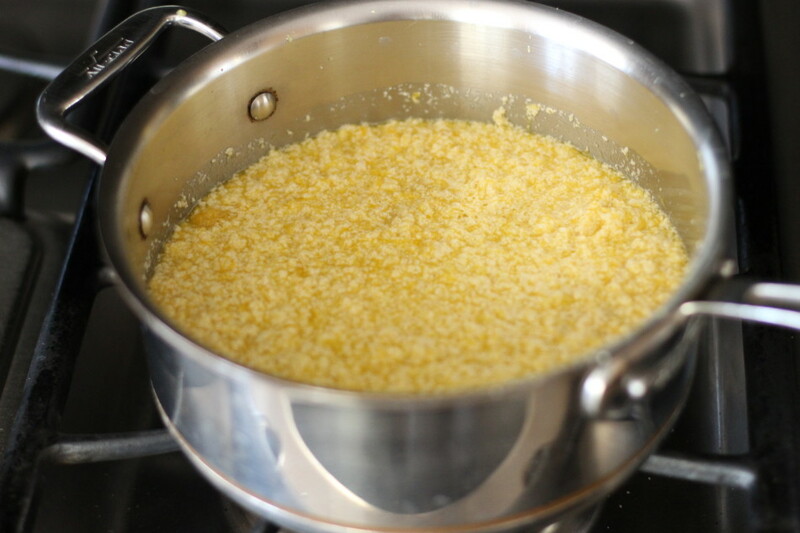 Reduce to medium-low speed, add the eggs and egg yolks one at a time, and then add the lemon zest, lemon juice, and salt. It will look curdled, which is normal. 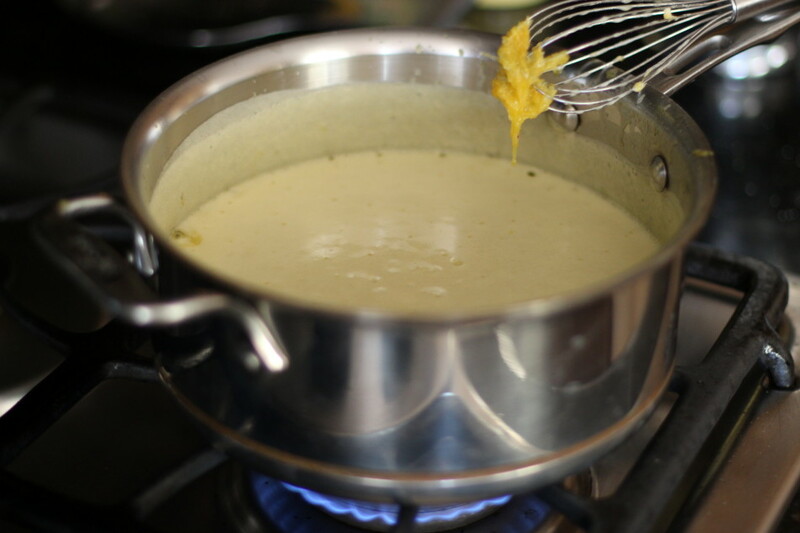 Pour the mixture into a small heavy bottomed saucepan and cook over medium-low heat for 8 to 10 minutes, until thick, stirring often with a whisk to prevent large bubbles from forming into a boil. Note: You do not want to let it boil or the eggs will cook like scrambled eggs. 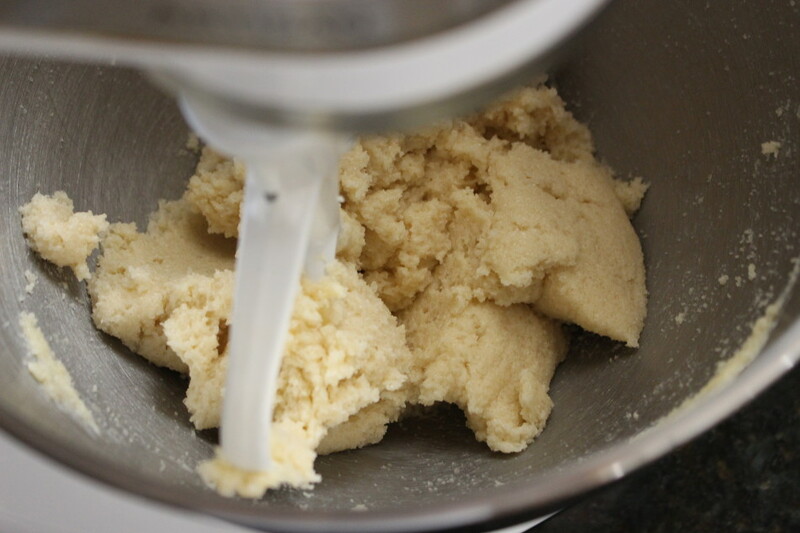 Whisk briskly when it starts to thicken and reduce heat to low for 1 to 2 minutes. Here is when I attach a candy thermometer to make this foolproof (and easy). Note: When you see big bubbles coming up for air it is just about ready, keep stirring to prevent any curdling on the bottom of the pan. It will be ready when the candy thermometer reaches 175 degrees F and the curd coats a spoon. Pour into a quart sized glass jar (or bowl), place plastic wrap directly on the filling to prevent a film. I use a rubber spatula to get every last bit into the jar. Cool to room temperature, then refrigerate for at least 2 hours before serving. This stores well in the refrigerator for 2 weeks. Oh my gosh this sounds too good to resist! I don't know what I'm going to do with all this lemon curd but I love anything lemon and think I just may indulge in making a tart. I have never seen a dairy free lemon curd in stores. 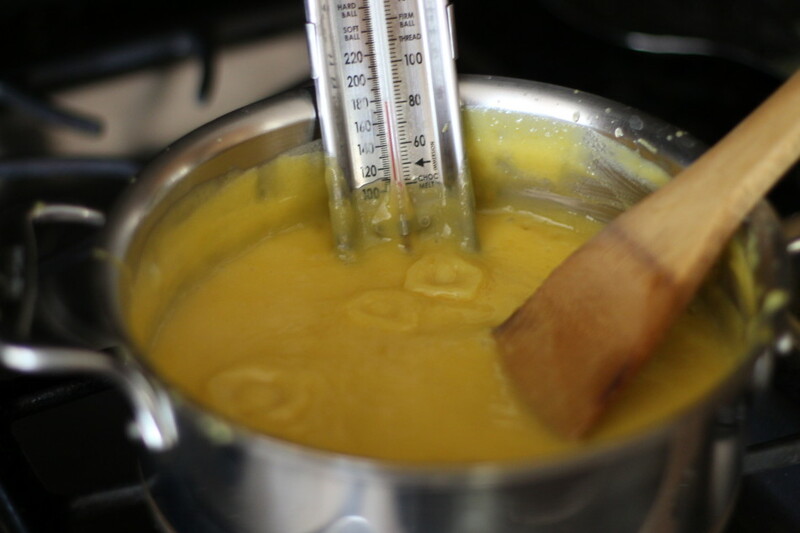 I have tried to make a lemon curd in the past but it never worked out then again the recipe I used didn't have all the photos like you posted. Excited to try your recipe! Seeing that big glass of lemon curd just gave me an idea, spread it between pancakes with some fresh raspberries on top for Valentine's Day. My family will love this thank you! Great use of lemons (have a eureka lemon tree). This is a "condiment" for sure! Okay that's it I'm going to get a candy thermometer! It's been ages since I've had lemon curd. I could never sign gluten-free and dairy free anywhere; this will be a treat. Thanks Jessica! I am already envisioning this lemon goodness sandwiched between 2 layers of sponge cake. What a treat this is going to be! Good point Jen, I took the photo after scraping the sides down so it looks thick. The photo I took while my beater was going was blurry :( 2 minutes of creaming is all you need using a stand mixer on medium to high speed. Enjoy! OMG this would be perfect for my husbands favorite yellow cake that I make with strawberries and coconut cream, gotta do lemon curd instead for extra luxe!! I've never really thought of lemon curd when thinking of essentials to whip up but it's so true this DOES go with so much. We can have with crackers and toast and some curd can strangely end up in my ice cream each night (shh). And happy you mentioned that tip about zesting before squeezing. My Mother-in-law didn't know this and I had to teach her! 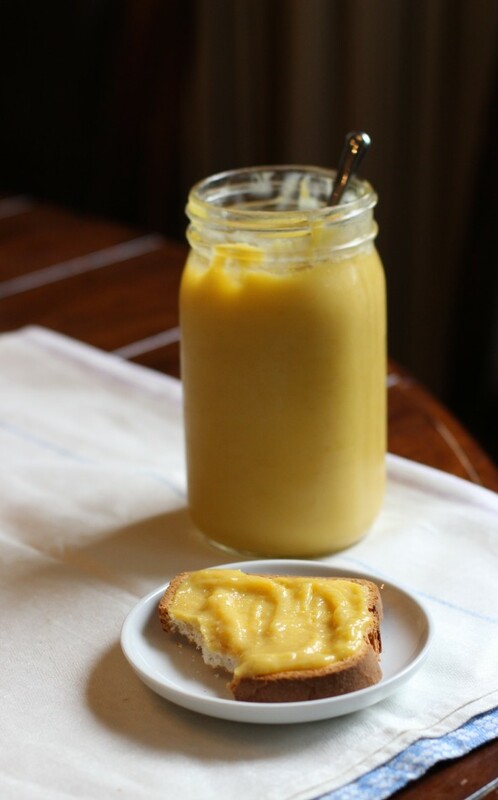 I just saw this after looking on Pinterest for a gf, df lemon curd. OMG am I thrilled to have found this and your blog. I think your story is so inspiring and was touched by your dedication. 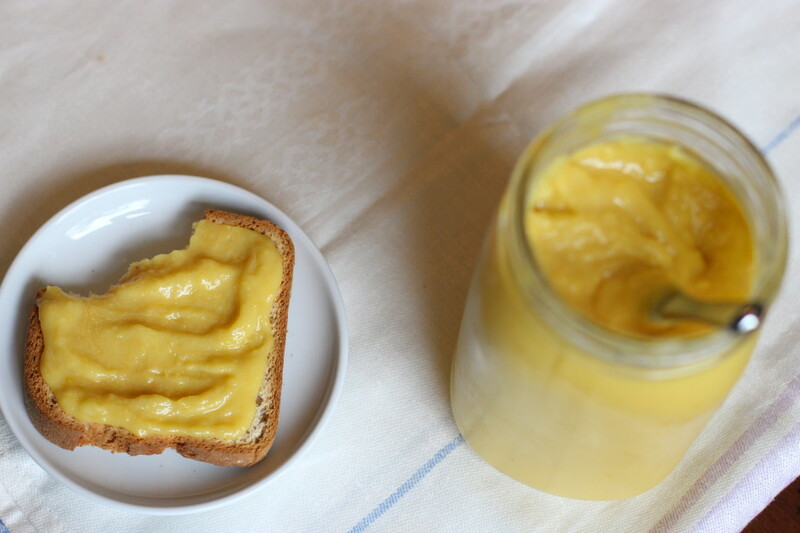 This lemon curd looks incredible and want a big tub of this to myself! I can never find dairy free and gluten-free lemon curd. Saw your recipe on Pinterest and it looked too good to resist. 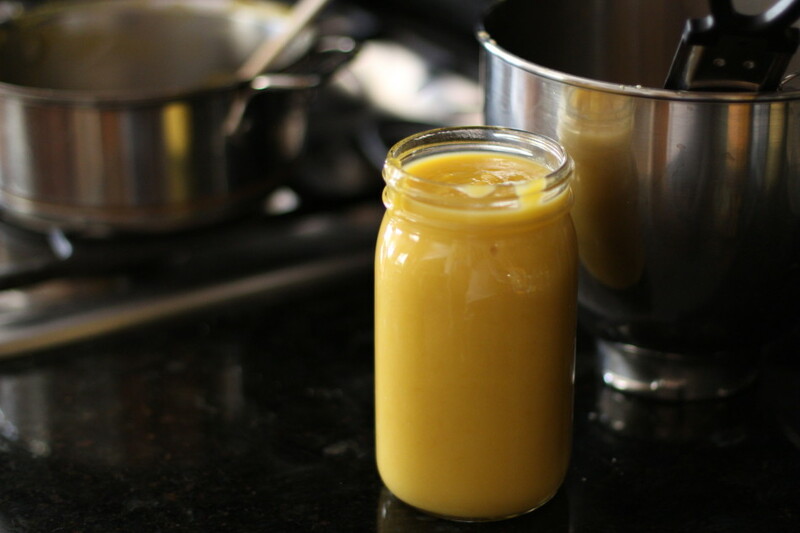 I made it today and cannot believe how luxurious this lemon curd is without any butter, truly an astounding recipe and so happy I took the time to make it today. Thanks!! I cut the sugar to 3/4 cup to make it less sweet which it was and a good amount of lemon flavor that tastes sublime but was thicker for some reason and didn't spread like yours. Not sure if less sugar affects consistency. I will add more lemon juice next time. I will be using the rest for lemon poppy pancakes this weekend. Great recipe. 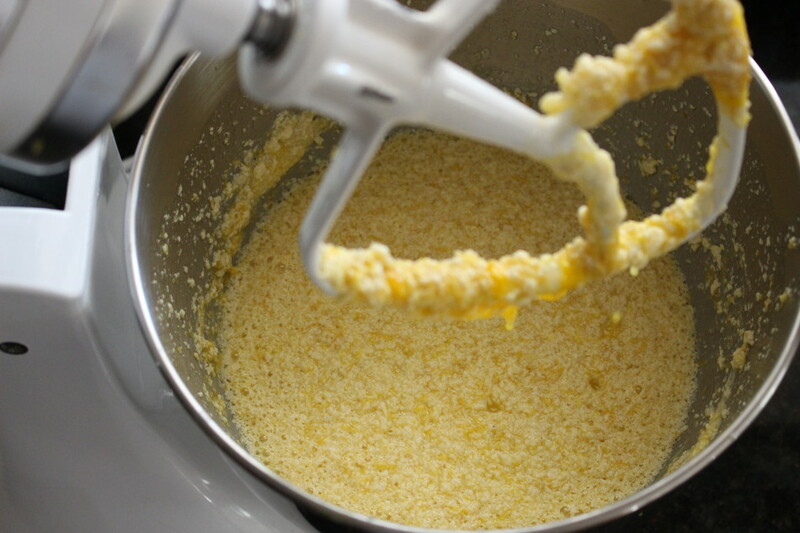 Your recipe was easy to follow and the curd has such a wonderful lemon flavor without being too tart. Nice contrast between sour and sweet. Thanks for a great recipe!! I will be using it to fill my coconut cake recipe to change it up. Happy to hear! Coconut cake with lemon curd sounds wonderful, enjoy!! This may sound like a silly question: can this be made egg free? I cannot tolerate eggs. Thanks. I haven't made this egg free since my oldest son doesn't care for lemon curd. If I had to, I would play around with an unflavored gelatin mix and add it in at the very end, stir it up and let it sit overnight. That would be my first attempt. If you do give it a try please let me know how it turned out!